If you haven’t experienced the uniqueness of Old Florida culture, you haven’t been to Boynton Beach! The team at DUCTZ loves Boynton Beach for its Ocean Avenue with restaurants and boutiques all snuggled together. Oceanfront Park is the perfect place to get your toes in the sand, and it’s hard to miss that giant sea turtle sculpture! 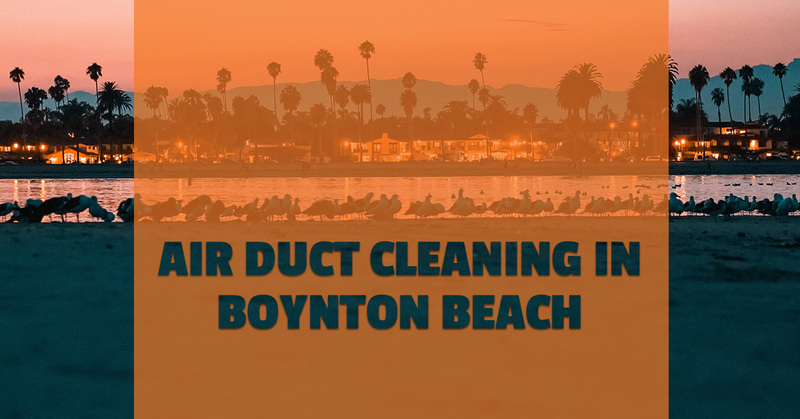 As a community on the eastern coast of Florida, Boynton Beach gets its fair share of intense temperatures and conditions, and everyone depends on their HVAC systems in order to stay comfortable. But is your HVAC system able to do its job correctly? Maybe your HVAC system has been running trouble-free for years. Maybe you have no obvious reason to worry about contamination or dirt in your ducts. That doesn’t mean everything is fine. Your HVAC system is designed to function out of sight, which can end up concealing a lot of trouble. Instead of asking yourself if your ducts need cleaning, it’s better to ask yourself when your ducts were cleaned last. This is a question that many people can’t answer … and the people who owned the house/office building before them wouldn’t be able to answer, either. After all, no maintenance budget is endless, which means air ducts can fall under carpet replacements, roof repairs, and other pressing items. When you make sure that your air ducts are clean, your air filters last longer. Your HVAC units themselves will last longer. Our regular maintenance program will ensure that you can enjoy your home or business with complete confidence, no matter the time of year. Making the most of your HVAC system is easier when you have the support of professionals like the team at DUCTZ. Contact us for world-class air duct cleaning today!